Use code DEC5 for $5 off any order of $50 or more. We hope you use it well. 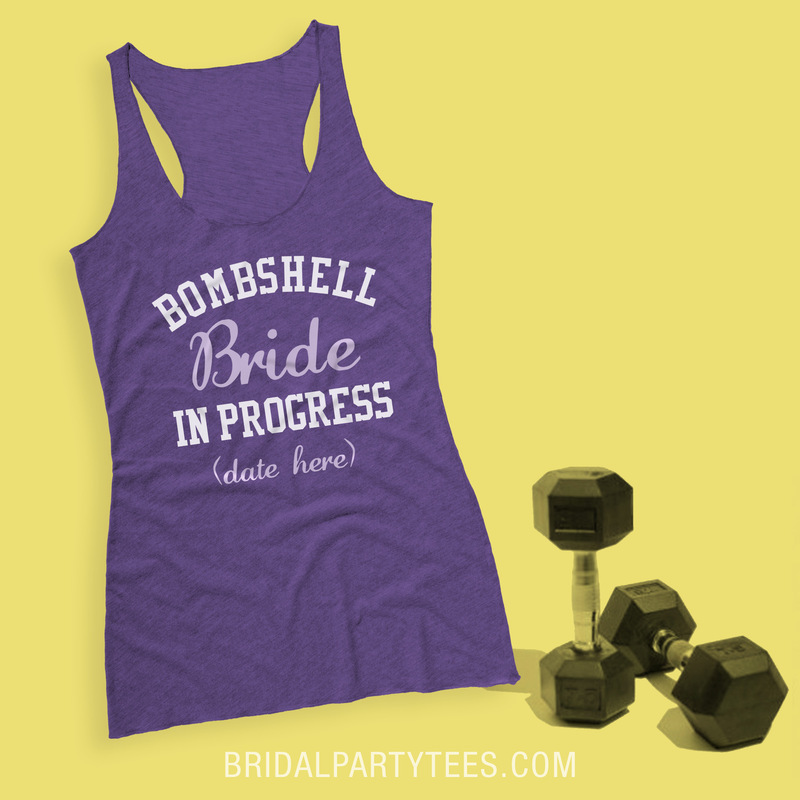 We hope you customize lots and lots of bachelorette tank tops with that code. And if you want, you can start shopping right now! It doesn’t matter if you are marrying a sailor or simply just love the beach. Nautical themed weddings are trendy no matter if you go with the classic navy blue or mix it up with coral and mint. The nautical theme is versatile and very easy to personalize to give your guests an experience they’ve never had before. Anchors, stripes, and boat knots are just a starting point but make your experience extra unique by customizing Nautical Themed Bridal Party Shirts. Bridal Party Tees has a great selection of nautical art including knots, anchors, and boats to help achieve the exact theme you are looking for. 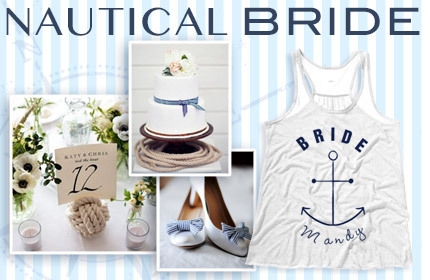 Bridal Party Tees has put together a Nautical Theme Inspiration Board to help infuse your wedding with a unique and classy look inspired by the sea. So what are you waiting for? Drop the anchor, tie the knot, and set sail before the veil! Get Ready in a Zip-Up Hoodie! On your wedding day you’re going to spend hours in a dress that is bound to get uncomfortable by the end of the night. So, why not make yourself as comfortable as possible while getting ready for the big day by wearing a bride zip-up hoodie?! A customized zip hoodie makes for a great photo opp! 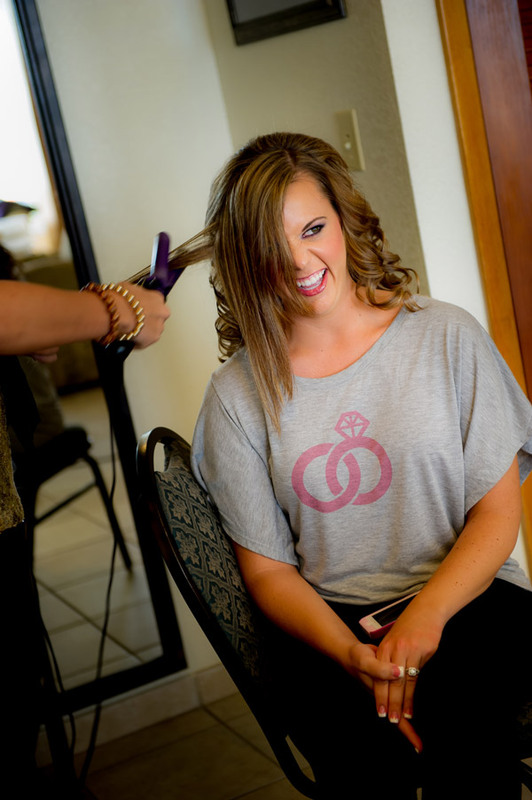 Since many brides opt to have their photographers document their time getting ready, custom wedding hoodies have become a popular trend. 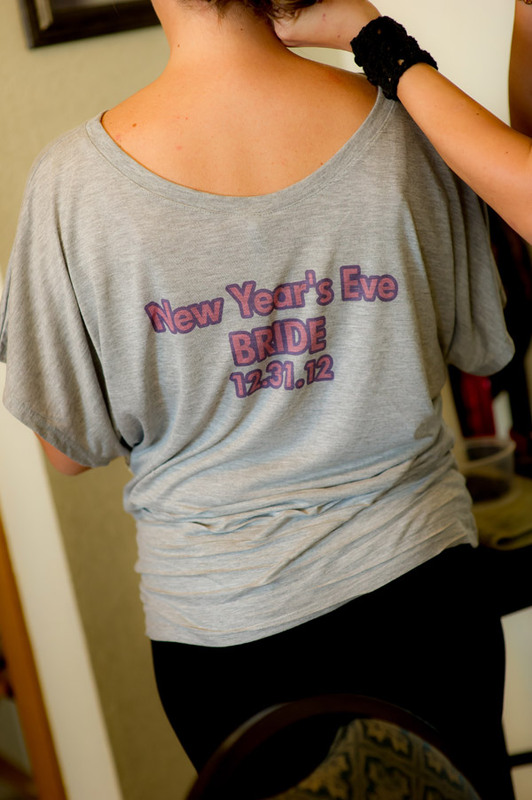 Add your new last name or wedding date to the hoodie for the perfect custom touch! 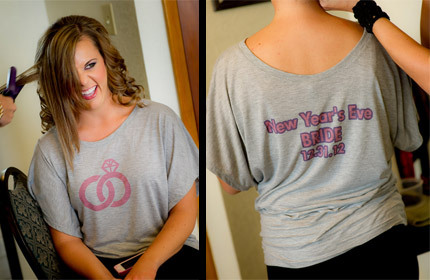 Plus, our bridal sweatpants make excellent companion pieces for the hoodies! We’re excited to announce that we now have iPhone 5 cases! We’ve created some awesome designs for you to browse through, or you can upload your own art. We also have cases for the iPhone 4/4S. 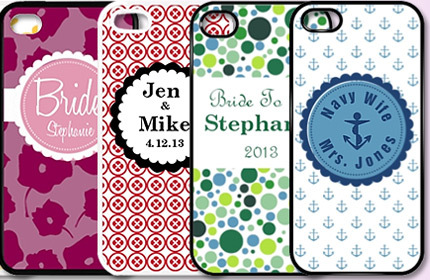 Custom iPhone cases make great gifts for the bride-to-be. They’re also great for displaying your wedding photos after the wedding for everyone to see! The possibilities are endless! It’s November, which means that it’s time for the month-long event of growing a mustache known as Movember. While others may call it No Shave November, the purpose of Movember is to raise awareness of men’s health issues, specifically prostate and testicular cancer. 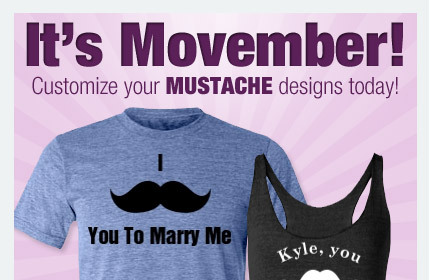 Why not show your support (or love of mustaches) with some custom mustache shirts and accessories? 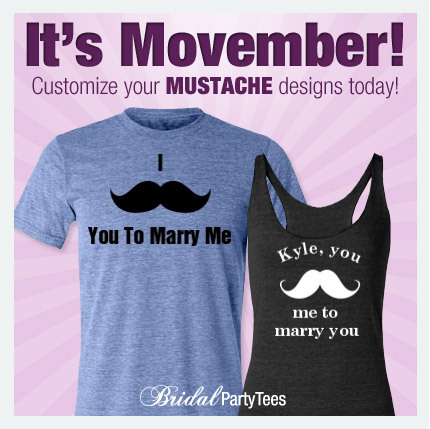 We have plenty of designs to choose from, or you can customize your own! BPT712: free U.S. economy shipping on orders of $30+. Chances are you’re already spending a lot of money jetting off to a fabulous honeymoon destination after your wedding. Let us help your wallet out with free shipping! Custom bikinis, tote bags and tank tops are all perfect items for your honeymoon! Offer ends 7/18/12 at 11:59 PM EST. Make Your Own Bride Hoodie! Winter wedding? 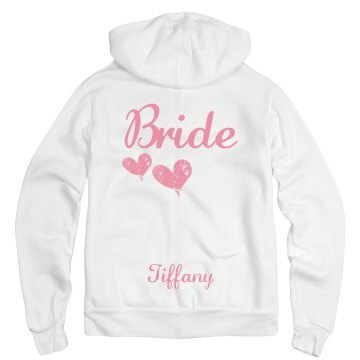 Bundle up in one of our custom bride hoodies! Our hoodies come in a variety of colors and styles that allow each item to be totally unique. Whether it’s half zip or two tone, cotton or french terry, we have something for everyone! 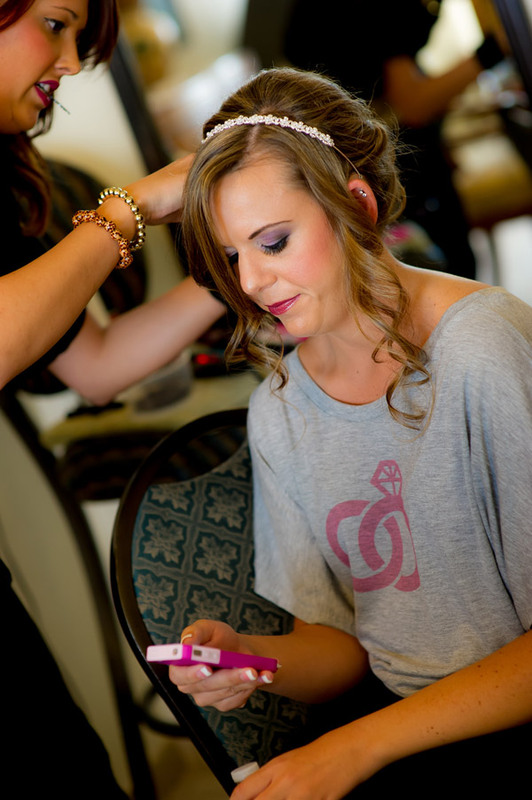 And Bridal Party Tee’s easy-to-use design center makes customizing a breeze! 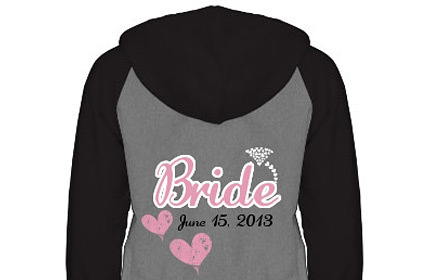 Visit our site and create your own custom bride hoodie today! Get the party started with code BPT216! 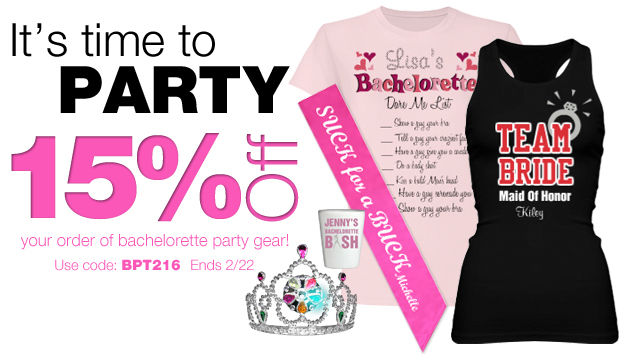 Shop now through 2/22/12 and receive 15% off all of your bachelorette party needs. Not sure where to start? Here’s some inspiration!